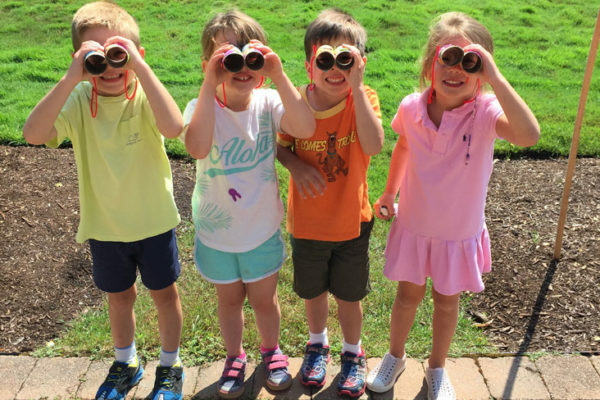 The summer is a fun time of year for our young members at the Bay Club! 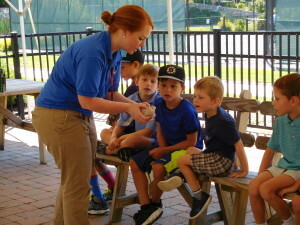 Each year, our summer program, Club Seahorse, is offered to children and grandchildren of Bay Club members. The five-day weekly program is available for Pee Wees (half days for 4 and 5 year olds) and Juniors (full days for 6-10 year olds). 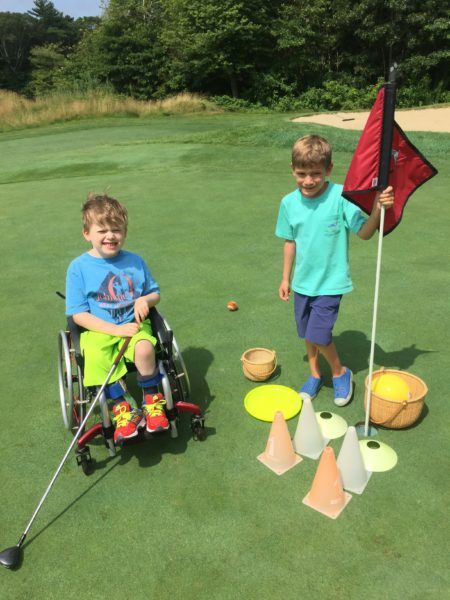 While mainly a sports-oriented program providing golf, tennis and swimming, participants also enjoy traditional club activities such as arts and crafts, games and outdoor sports. Each week features a different theme which is carried out through special guest visits as well as crafts and games. 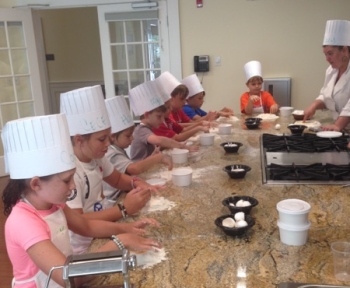 This year, the children will enjoy visits from Buttonwood Park Zoo and the Boston Museum of Science, as well as Bay Club Chefs for hands-on cooking demonstrations. The last week of the program will feature the ever popular “Bay Club Olympics,” where the competitive spirit comes out in everyone. The applications are already coming in and we are working on creating another memorable season for the Bay Club youth. It’s no secret New England experienced a rather long and cold winter. However, now that May is here and the weather seems to be turning in our favor, we can begin to focus on our favorite outdoor activities. The Bay Club has great opportunities for the younger generation looking to get involved with golf and tennis. 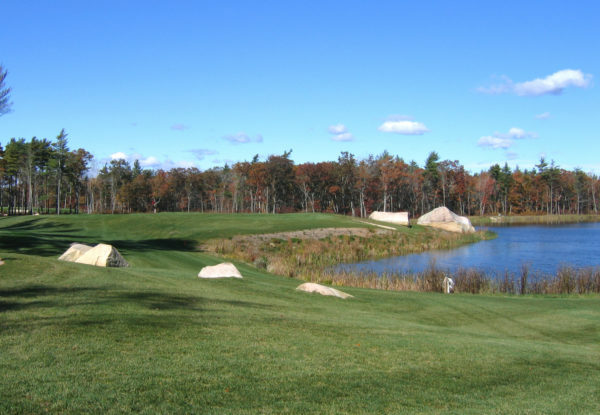 Pricing discounts are available for active members of the Old Rochester Regional High School or Old Colony Regional Vocational Technical High School golf and tennis teams, as well as those affiliated with a current Bay Club member. Junior Golf memberships are available to youth between the ages of 13 and 23. In addition to access to the golf course, practice facilities and Golf House restaurant, Junior Golf members can take advantage of professional golf instruction and certified Titleist Performance Institute instruction. 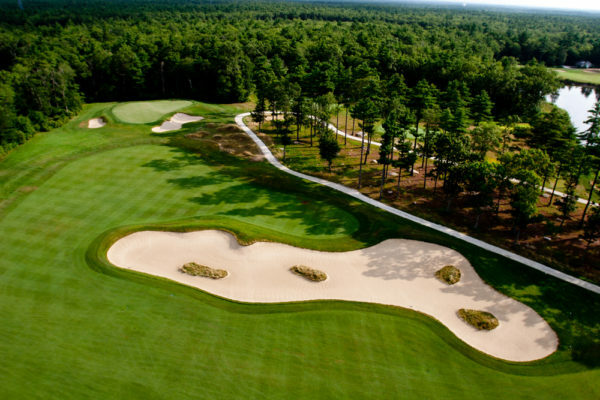 Other benefits include eligibility to play on the Bay Club’s Junior Inter-Club and Junior PGA League Teams and to join the Bay Club Junior Academy. Our Junior Tennis memberships are for those aged between 10 and 23. This membership offers access to the tennis courts, practice facilities and Golf House restaurant. Members can also take advantage of professional tennis instruction through private lessons and group clinics. These memberships are limited so if interested, please don’t hesitate to contact Head Golf Professional, Ben Egan at 508-207-9231 in regards to Junior Golf, or Bay Club General Manager, Greg Yeomans at 508-207-9216 in regards to Junior Tennis. 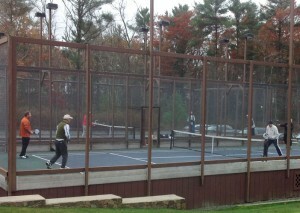 The Paddle Tennis season is off and running at the Bay Club! The weekly drop-ins along with various clinics, tournaments and events have seen great attendance to date. Perhaps one of our most popular paddle events is the Chili Social. Held monthly during the paddle season, these socials bring members and guests of all abilities together to enjoy Executive Chef, Jim Mercer’s beloved Turkey Chili along with some fun, social paddle. Even the coldest temperatures experienced this winter have not deterred players from attending. 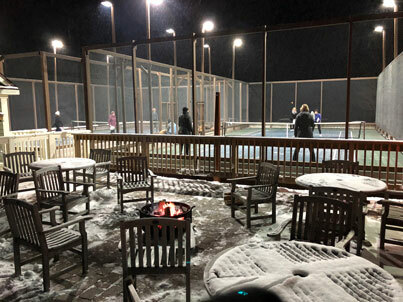 The patio next to the courts offers a place to warm up adorned with a fire pit and heaters. And if needed, there is always the heated Racquets Hut to duck into for the especially frosty evenings. We expect to see a great turnout from our growing paddle community for the next Chili Social being held on January 19. For more information on the game of paddle, click here to read a previous blog post on the topic. 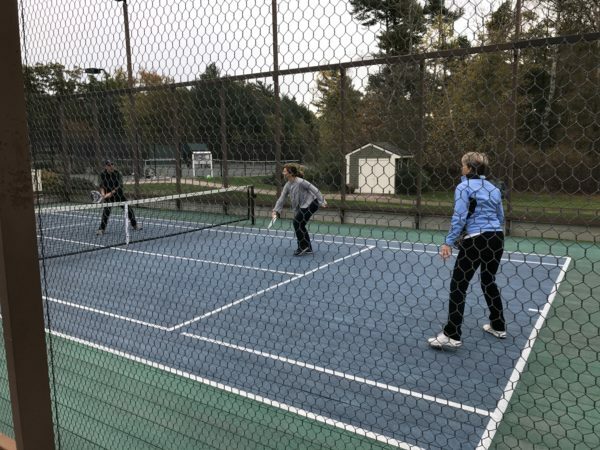 When the fall and winter weather moves in, members of the Bay Club make the shift from the tennis courts to the paddle courts. Also referred to as platform tennis, paddle is similar to traditional tennis with a few key differences. The court is on an elevated surface and about a third of the size, surrounded by 12-foot tall rugged fencing to allow for play off the walls. The racquet used is different as well, a paddle with holes, versus a strung racquet for standard tennis. We are very excited about the season so far, as many new players have been trying out the sport; coming to weekly drop-ins and tournaments. Bay Club employee Matt Beatty has stepped into the role of Seasonal Racquets Activities Director to help with anything paddle related, including but not limited to helping members learn the rules and basic play. We’re looking forward to continued success for the paddle program throughout the winter. 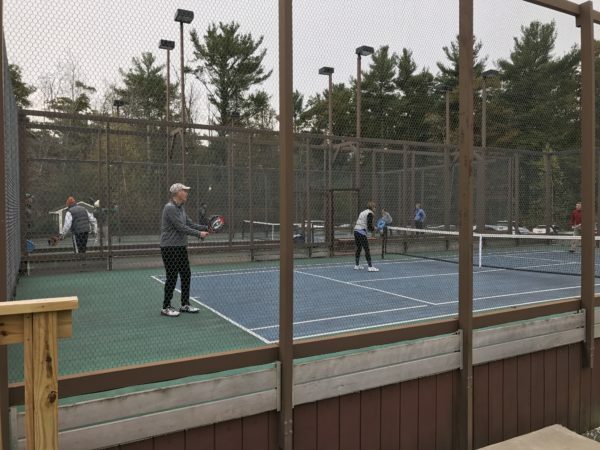 Bay Club members recently participated in a Davis Cup style event with members Â from the Mattapoisett Casino Tennis Club.Â The group was divided into teams representing various countries.Â After a wonderful morning of tennis, players enjoyed a delicious lunch at the Golf House restaurant. The day concluded with cocktails and a potluck dinner at the Casino club with players bringing dishes indicative of the cuisine of the country they represented.Â Â It was a fun day had by all. Bay Club members are now able to make court reservations for racquet events online through FlxRez by ForeTees. Â Regarded in the private club industry as the finest online reservation system available.Â Some of the benefits of Â FlxRez include the ability for members to access court sheets 24/7 from any Internet-enabled device; book, modify or cancel court times online and create a â€œPartnerâ€ list.Â This new service will enhance member’s tennis and paddle tennis experience at the club. Looking to improve your groundstrokes with one simple tip?Â Initiate your stroke with a good shoulder turn.Â When you turn your shoulders you areÂ initiating power by creating torque in your upper bodyÂ and itÂ also helps prevent you from pushing the ball. 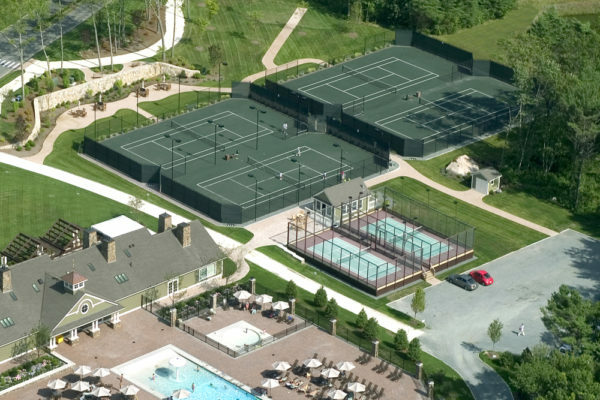 The Club features four Har-Tru Hydro tennis courts (two with lighting for night play) and two platform tennis courts. A full schedule of casual and competitive tennis is offered throughout the season as well as clinics and private lessons provided by the Clubâ€™s Professional Staff. 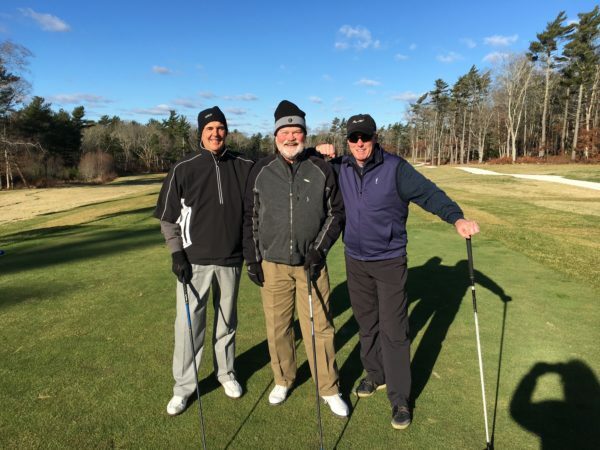 For more information about membership in the country club, residential opportunities or home-sites within the Bay Club at Mattapoisett, please contact us at 508-207-9232. The Bay Club recently hosted members from the Casino Tennis Club in Mattapoisett for the second annual Davis Cup tennis event.Â With ideal playing conditions, the round robin event was a huge success.Â The courts wereÂ decorated with the flags of the competing countries, USA, Italy, Spain, and Great Britain and the players showed their team spirit by dressing in their countries colors both of which set the tone for a wonderful morning of tennis.Â Â After working up an appetite, the players enjoyed a wonderful lunch at the Golf House restaurant.Â The festivities concluded with an international themed dinner at a memberâ€™s home. A new tennis event has been organized by Bay Club Mattapoisett head pro, Chris Shannon.Â Bay Club at Mattapoisett members will join players from the Mattapoisett Casino in a Davis Cup “international” themed format.Â Â Matches will be played at the Bay Club with a lunch served on the patio of the Golf House Restaurant.Â The event will conclude with cocktails, dinner and awards at the Casino club. 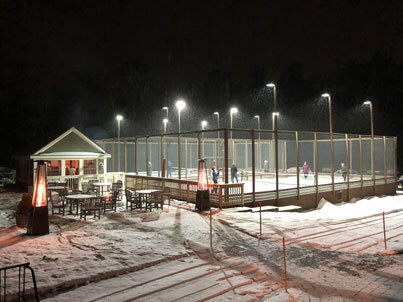 The Bay Club at Mattapoisett has four Har-Tru Hydo Tennis Courts, two of which are lighted.Â The weekly tennis schedule includes Men’s and Women’s Round Robins, Stroke Clinics, drop in events, Aussie Cardio Class, Junior Clinics, children’s camps, matches and Member Guest events. Chris Shannon, Director of Tennis for the Bay Club at Mattapoisett spends his non summer months in CA at theÂ Springs Country Club (where he hosted Bay Club members this past winter for a Palm Springs tennis excursion).Â Chris, a teaching pro since 1998, grew up on the courts of Australia, moved to the States at sixteen, and then played for Stetson University in Florida.Â Off the courts Chris can be found with his three young daughters and his wife Susan. 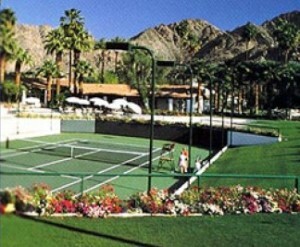 The Bay Club Mattapoisett is pleased to announce that the Tennis Committee, along with Director of Tennis Chris Shannon are putting together a tennis trip to the Palm Springs area for March 2010. The trip will include tennis play and instruction at The Springs Club (Chris’ winter club) as well as attending the BNP Paribas Open. This tournament, featuring the world’s top male and female tennis players, takes place in Indian Wells between March 8 and 21. The Bay Club trip is scheduled for mid March.